Paddle boarding has a minimum age of 8 years. To put it simply you stand on a board and have a paddle to propel yourself along. Stand up Paddle Boarding is often shortened to SUP as it makes it easier to say. The boards are large stable platforms making them user-friendly for all ages and abilities. SUP has taken off around the world! So what are you waiting for? Book your session today with Board Games Surfing and try out this awesome activity. Paddle Boarding is great fun and is fast to pick up. It is perfect for an adventure along the Pembrokeshire coast. 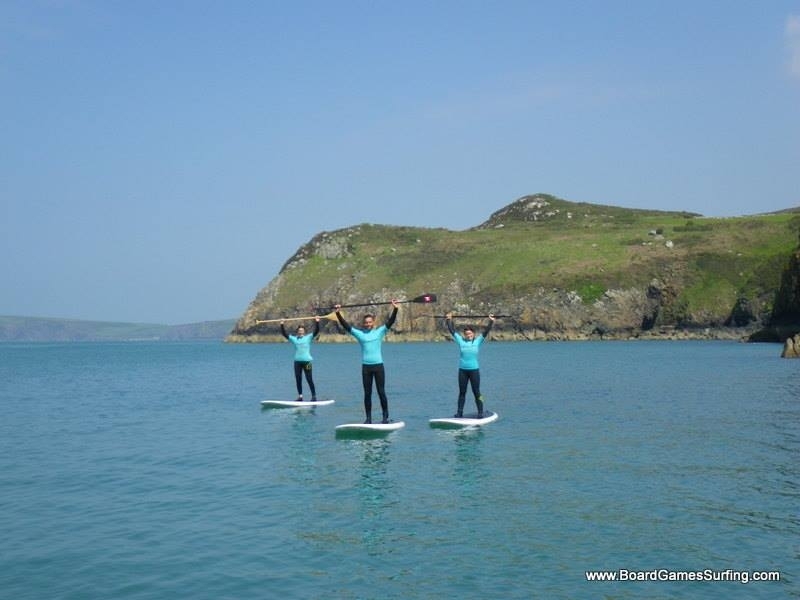 At Board Games Surfing we aim to make sure you feel at home on your board within the first session and you will undoubtedly get a unique view of Wales’ coastline! At Board Games we are passionate and enthusiastic about what we do. We really care for everyone that wriggles into a wetsuit and wants to get in the sea. Our team take the time to make sure that although you are within a group environment everyone gets individual attention. 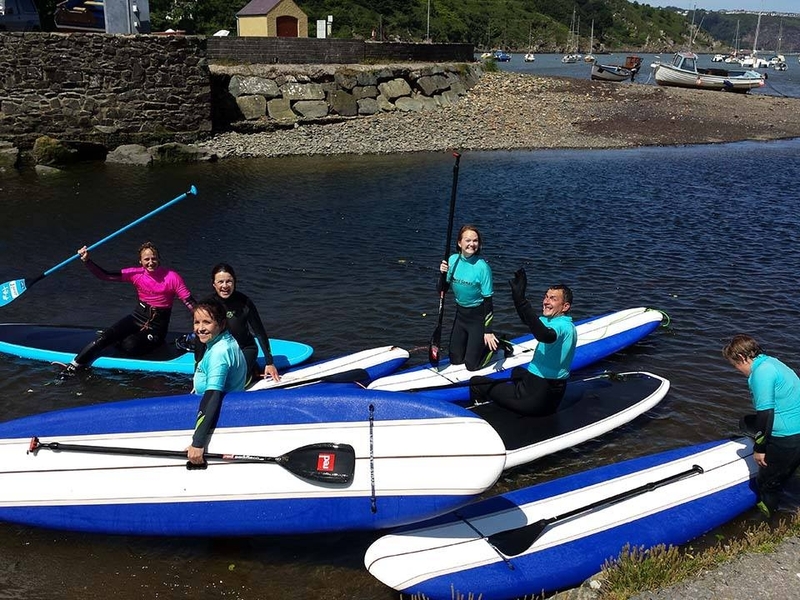 And if you need it we can make a bespoke Paddle Boarding experience just for you or your group. 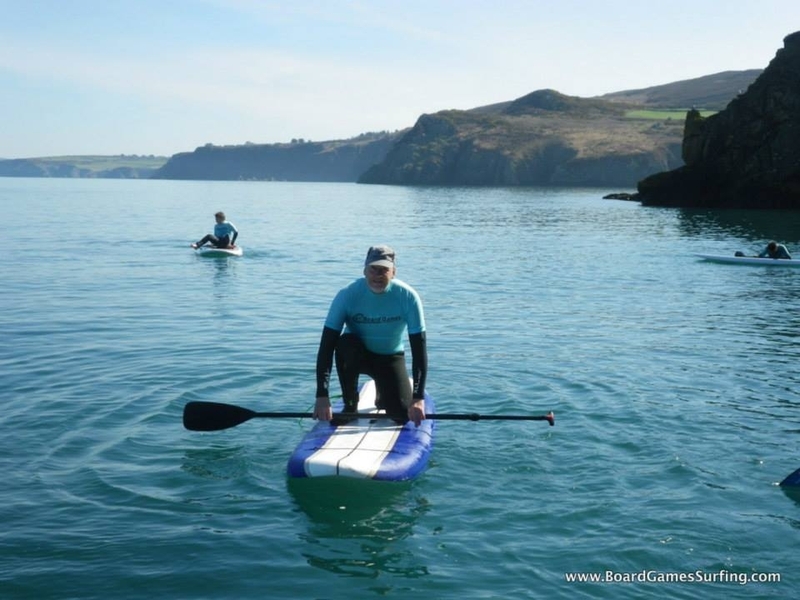 You will meet a member of our SUP coaching team at the beach or harbour. From there they will take the time to find out if you have paddled before and what we are planning to get up to in the session. 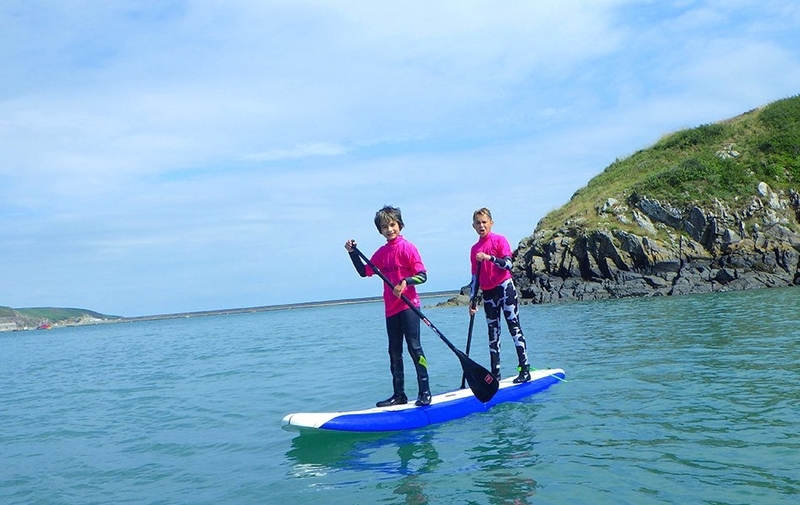 Our SUP adventures will be broken down into a few parts; learning a few skills, then getting out and about on the Pembrokeshire coast. The most important thing we will do is have some serious fun! You will have a member of our team there alongside you, to help you get going and improve your technique. With an intimate knowledge of the Pembrokeshire coast, your coach will guide you on an unforgettable adventure. So if you fancy having a bit of a paddle about we have everything you need! We have full winter wetsuits (unless of course the sun is out and it’s feeling hot in which case we may well be able to wear boardies and sun hats! ), wetsuit boots, paddle boards and of course some paddles. If its a bit chilly we also have gloves and hoods to keep you toasty warm. Our SUP coaches always carry a first aid kit in a bag so if you need to take anything with you this is no problem. The only thing you will need is your swimwear, a towel and maybe some sunscreen! We use many locations on the beautiful Pembrokeshire coast. 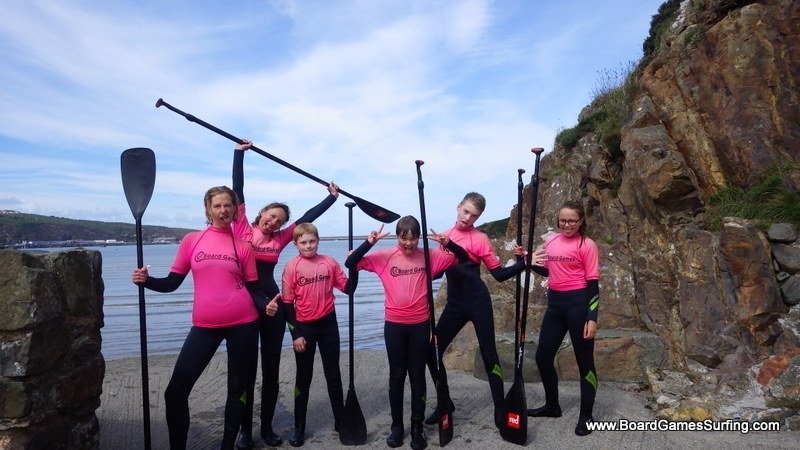 We will generally start off in a harbour to get your skills up and then go out and explore the Welsh coast. If you have been out before with us, we could start from a beach instead (weather conditions allowing). This activity is controlled by what the wind is up to. 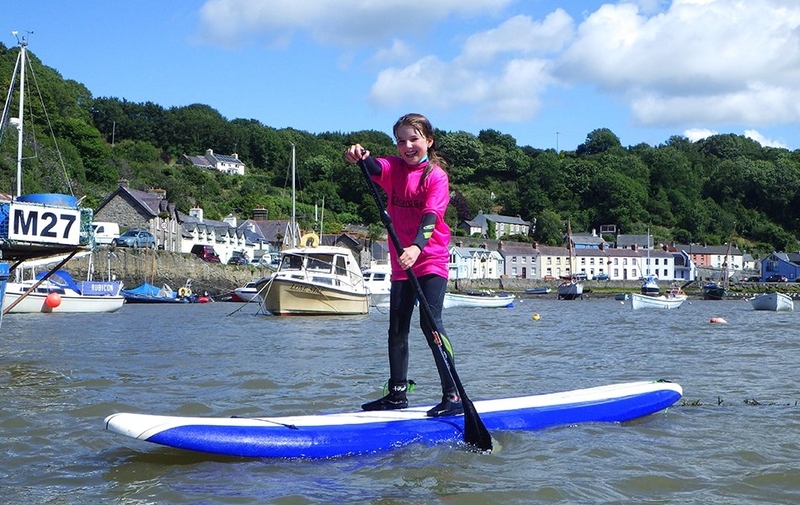 Most Paddleboarding tours start at Lower Town Harbour Fishguard. Heading along the North Pembrokeshire coast, exploring caves and hidden beaches. Historically, Africans and indeed many other river based and coastal cultures, have stood up within their canoes and upon rafts and paddled standing for thousands of years. Conceptually therefore, the idea of standing and paddling using an extended canoe paddle is far from being a new concept. From a contemporary standpoint and as a sport, stand up paddle surfing really began taking off after 2005. 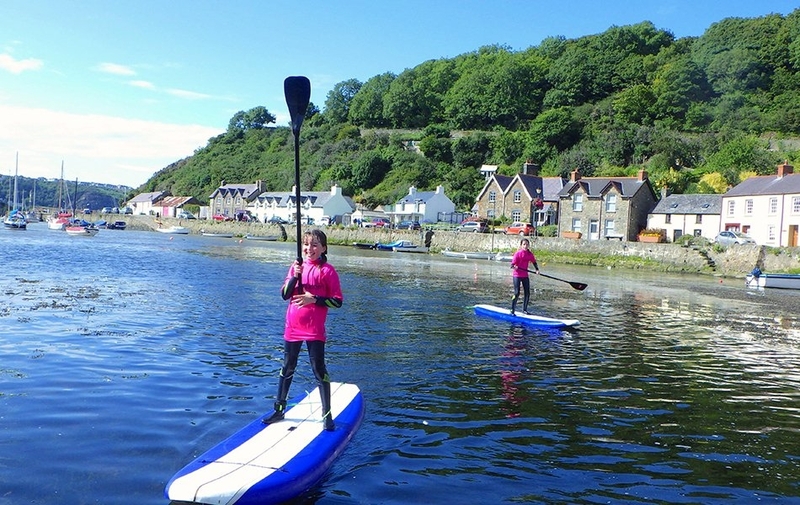 Developed paddle surfing for the modern water sports world. The first “modern” surfer to bring Stand Up Paddle Surfing out of Hawaii and to the mainland United States was Vietnam veteran, Rick Thomas. Custom surf shaper Jimmy Lewis, created one of the first modern production boards, the All Around. Traditional style surfers have converted to stand up paddling because of the versatility of the new sport. Stand up paddle boarding offers surfers the ability to catch more waves in a set, as well as offering a better view of incoming sets (ocean waves they may want to ride that are approaching from the sea). Owners of Standup Paddle Sports and SurfingSports.com of Santa Barbara, California, pioneered and helped establish the sport and industry of standup paddling in California. Deb Thomas was also the first female standup paddler in North America in 2005.They brought the first production SUPs to market with Maui shaper Sean Ordonez in 2006, and theirs was the first company to open a dedicated SUP store in North America, in 2007. On August 8, 2007, on the North Shore of Lake Tahoe in Tahoe City, California, the first stand up paddle board race was held. In a seven-mile race, 34 male and female competitors competed. This was the beginning of the Ta-Hoe Nalu Paddle Festival. Claimed the first SUP racing world champion title when he won the season’s finals of the first Standup World Series championship races, held at Turtle Bay Resort, O’ahu, Hawaii on September 13–14, 2012.